Rummy is a popular card game that has been in existence since the early twentieth century. There are numerous variations of rummy and it continues to be adapted and changed to suit certain players and styles of play. Most of them however have in common the core idea that you draw a card from a main pile and try to match it to your ‘hand’. If you make a ‘hand’ then you discard those and continue on playing until you discard all your cards. Rummy is played with a normal 52 card deck of playing cards. A dealer is chosen at random to deal and the game is normally best played with between two and four people. If only two people are playing ten cards are dealt to each player and if three or four are playing then seven cards should be dealt. If you must play with more than four players, deal only six cards to each player. The leftover cards are placed face down in the centre of the table and the top card is turned over and placed faced up next to it. Each player can look at the cards they’ve been dealt and they then arrange them in their hands. The aim of arranging the cards they’ve been dealt is to see if they have any cards they can lay off, meld or discard. The object of the game in rummy is to get rid of all the cards in your hand. You can do this in a variety of ways. Melding in rummy refers to looking at the cards in your hand and seeing if you can make either a ‘group’ or a ‘run’. A group is three or four cards of the same number in your hand. An example of this would be having three or four 5’s in your hand. If you have these you must place them in front of you face up, removing them from your hand. This is also the same if you have a run in your hand. This is three or more cards in your hand that are sequential in order. An example of a run would be 3, 4, 5, or 9, 10, Jack, Queen, King. The term laying off means that you add a card or cards to your meld that already exists on the table. This card has to create another valid meld, so for example adding a 4 or a 9 to an existing meld of 5, 6, 7, 8. The last option is discarding where you get rid of a card from your hand onto the discard pile. You get to do this at the end of each turn. Rummy progresses with each player taking a card from the centre pile of cards or from the discarded pile of cards. This card is then judged as to whether it is of any use to the player and if so it is added to their hand. In doing this, they must throw away one of the cards in their existing hand. This card is placed on the discarded card pile and is available for the next player to choose to add to their hand if it is of use to them. If you draw a card from the centre pile of cards and you want to keep the card you’ve drawn, you simply follow the same procedure where you keep it and discard an existing card in your hand. Play continues in this manner until one player has managed to either meld, lay off or discard all of the cards in their hand. If play continues for a lengthy period and all the cards in the centre pile are used, simply turn them over and start reusing them. As soon as someone gets rid of all their cards, play ends and you may continue on with a new round if you wish. Many players who play rummy will decide to play a set number of rounds and each round they’ll be awarded points based on winning. 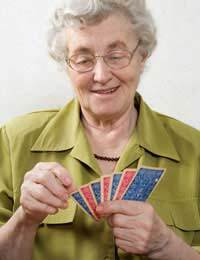 Other options that people often play in rummy are that when someone wins a round, the other players then count up the cards left in their hands. Each card will be awarded the number of points on it and the face cards (King, Queen, Jack) are awarded ten points each. For an ace the player is awarded one point. These points are counted up at the end of each round and when the set number of rounds are over, the cumulative points are totalled and whoever has the most wins. In some games, people will opt to have the ace counted as a high card rather than the usual low card. Also some variant ways of playing rummy allow players to lay off their cards onto other players melds on the table. This allows you to get rid of your cards quicker, but isn’t one of the more popular ways of playing rummy.